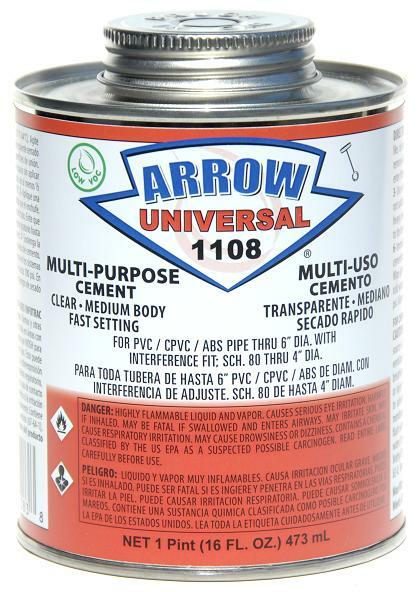 1108 is a multi-purpose, medium bodied, fast setting solvent cement for use on all schedules and classes of PVC, CPVC and ABS pipe and fittings up to 6” diameter with interference fit; Schedule 80 through 4” diameter. Meets applicable performance standards of ASTM D 2564, D 2235, F 493 and the Uniform Plumbing Code. 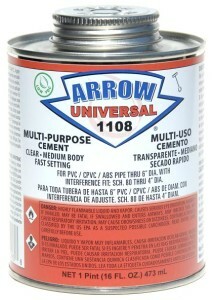 High-strength formulation for plumbing, irrigation, conduit, sewer, drain, waste and vent piping systems. Check local codes for acceptability of this product prior to use.